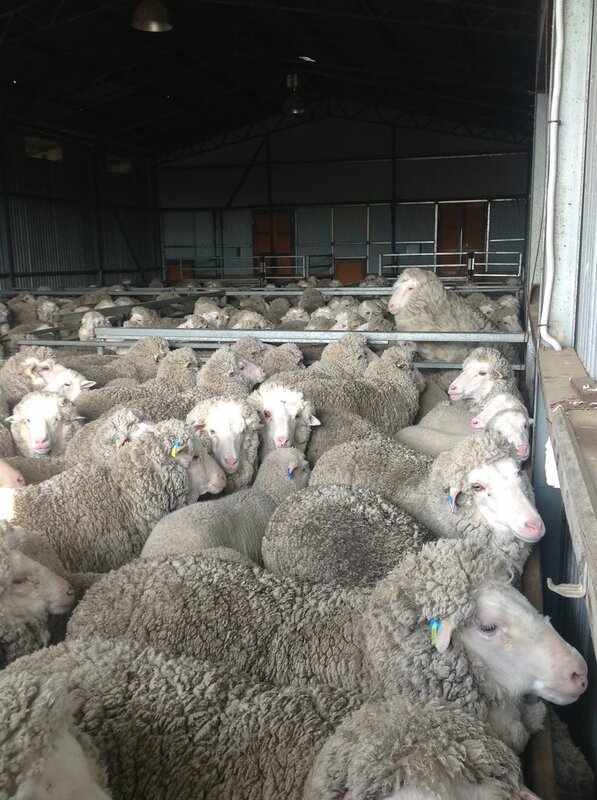 In the holding shed, staying dry for shearing the next day. Zac is on the far right, a couple of sheep back. The first thing we do is "crutch" all the sheep--clean their faces and bottoms, and shear the tails. Then we turn around a day later and start shearing. This keeps all the icky wool bits away from the good fleece. The high-stress, full-on action of shearing seems at first blush to have nothing whatever to do with meditation. It is without a doubt the most stressful experience my sheep have and, with a fleece hitting the wool table about every 2 minutes, it’s pretty stressful for me as wool classer, too. It’s noisy—the shearing plants are loud, the shearers’ music is even louder, and dogs barking while penning up provides a staccato overlay. Add to that the squeal of the wool press as it reaches its pressure limit on an almost full bale, and cacophony seems the only apt description. An airborne fleece just before hitting the table. Throwing a fleece is an art, and it's critical to the choreography: if it is thrown well, it lands in the right position and flat on the table. That makes the job of "skirting" the fleece much easier. Skirting is the beginning of my pas-de-deux with the rouseabout, as we move up our respective sides of the table, removing "fribby" bits from the edges of the fleece, then rolling the fleece and sampling it for soundness, before carrying it to the press. Underlying all of the noise and action, though, is choreography and something like meditation. The movements we are engaged in have been repeated in thousands of wool sheds, for a couple hundred years. There is not a whole lot to think about—hence the music, to help the hours along—and yet every one of us has to maintain a level of focus, fleece after fleece, sheep after sheep, day after day. The ballet and its accompanying cacophony make conversation nearly impossible, so the focus is simultaneously internal and external. The internal focus cannot distract from the external one, or things go wrong. And if one ballerina screws up, the whole choreography stumbles. Shepherding has taught me so much about simply being. As an honorary sheep, I’ve been allowed to enter the timelessness of grazing, resting, ruminating, socialising, fossicking, grazing, resting. I’m surprised to find a related lesson from shearing, this time from entering into the human timelessness of sheep after sheep, fleece after fleece, day after day. A week or so after shearing, the ewes enjoying sunshine and delectable browse in the area outside my kitchen window. I didn't shear the lambs--they don't have enough wool yet to make it worth the stress. I’m always grateful when shearing is over, with all the sheep in good nick, the wool sound and without any injuries myself. It will never be my favourite farming activity, but I’m pleased to have found something Zen about it. Next year, hopefully, I’ll remember the lesson of shearing timelessness, and allow myself to move easily into being as well as action. Zac and Pearl getting acquainted. I've finally quit procrastinating about getting my younger dogs into advanced training, and Pearl has surprised and delighted me with her competence. She's not surprised, I don't think, just hasn't been able to figure out why I've been so slow to let her do the job she knows perfectly well she can handle. Most of the time.